BJPsych Advances distils current clinical knowledge into a single resource, written and peer-reviewed by expert clinicians to meet the CPD needs of consultant psychiatrists. Each issue includes commissioned articles dealing with physical and biological aspects of treatment, psychological and sociological interventions, management issues and treatments specific to the different psychiatric subspecialties. Articles discuss comprehensive, practical approaches to clinical problems and explain the full range of therapeutic options, with useful features like MCQs, summary boxes, and associated commentaries. 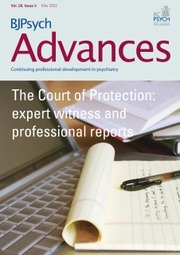 BJPsych Advances is essential reading for practising mental health professionals who need to be kept informed of current ideas, techniques and developments in psychiatry.